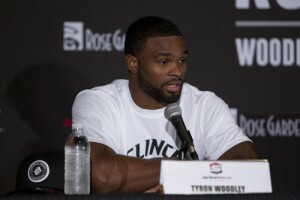 While the debate will continue today as to what’s in store for Tyron Woodley, as a result of his win over Carlos Condit at UFC 171, the welterweight is clearly happy with his performance. Woodley stopped the promotion’s #2 ranked welterweight in round two, after Condit could not continue due to a knee injury. While speaking to FOX Sports 2 after the bout, here is some of what Woodley had to say, when asked if the victory was bittersweet. Prior to facing Condit Saturday, Woodley knocked out Josh Koscheck at UFC 167 in November and is currently ranked #11.